BRISTOL SHOW 2011: PMC gives the PB1i the Signature treatment | What Hi-Fi? The company has decided to give the PB1i the upgrade treatment after receiving a positive response from customers to the FB1i and TB2i Signature models. Peter Thomas, founder and owner of PMC, has re-worked the 24dB crossover on the PB1i to provide "even finer detail and transparency" to the midband/vocal range from the 7.5cm soft-dome driver. This is coupled with a 27mm tweeter developed by PMC and SEAS. The company has also produced a 17cm bass driver specifically for the PB1i, with an ultra-stiff lightweight cone and large magnet assembly. The speaker uses PMC's Advanced Transmission Line bass loading. Each PB1i Signature speaker comes with a brushed aluminium serial number plate, and a signed certificate of authenticity form Peter Thomas. 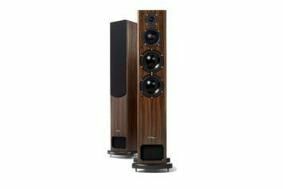 The British-made cabinets are finished in a rare Rose Palissandre veneer, only available on Signature Series products, and the speakers come with a 10-year warranty. Find out about all the other key product launches at Bristol in our show blog.